We all need a break sometimes, and I took mine the week leading up to Thanksgiving. Honestly, it was much needed because my creativity, organizational efficiency, and ability to get my s*** together felt like it was at an all time low (hence the lack of posts and pictures in this post). All good now though! Our Thanksgiving weekend was pretty awesome. It actually started on Wednesday for both me and Vishnu because we took the day off. I talked to my sister that morning, and we decided to get together for dinner. After going back on forth on what we should eat, we unanimously voted to go all out with a pre-Thanksgiving Thanksgiving meal. We kept it simple…kind of. 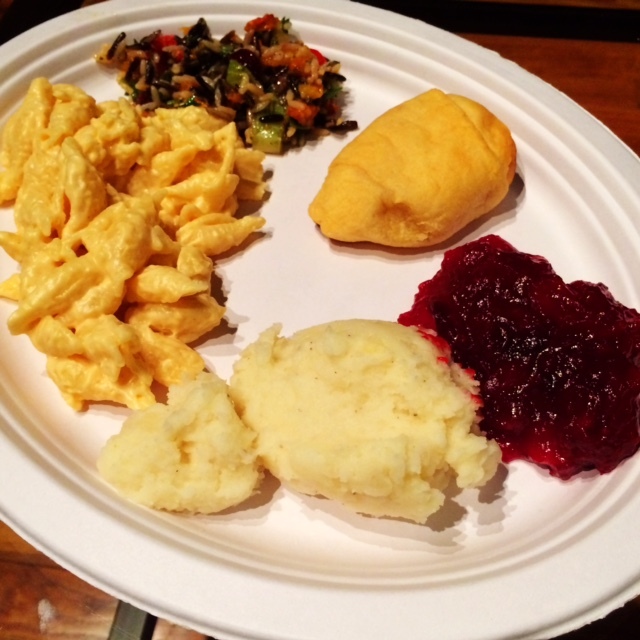 Vishnu and I ended up making mac n’ cheese, cranberry sauce, gravy, and mashed potatoes. All from scratch! My sister, her husband, and a few our friends came over, and despite the last minuteness in the kitchen, it was so fun. We woke up bright and early the next morning, packed our bags, and headed to St. Louis for the a couple of days. We stayed at Adarsh’s (my BIL) parents’ house and had a great time hanging out with Aekta, Adarsh, his parents and his sister. We ate delicious South Indian food, played games, and shopped (Black Friday outlet shopping for the win!). Vishnu and I drove back to Chicago on Saturday afternoon and were home by 8 pm. We ate dinner, watched a few episodes of Parenthood, and called it a night. Sunday was filled with unpacking, errands, and a little bit of baking (I made these delicious muffins). Vishnu – I’m one very lucky lady! Our home (both our actual apartment and Chicago) – a place we’ll be for the next 3.5 years at least! With my pre-Thanksgiving ‘funk’ behind me, I’m looking forward to the next few weeks – holiday parties, cookie baking, Secret Santa with my coworkers, Hawaii, Christmas, New Years, etc. I’m also looking forward to being more efficient with my time and tackling/starting a few projects. Hooray for end of the year productivity! I hope your Thanksgiving 2016 was filled with lots of delicious food, laughter, and loved ones. Here’s to Monday and few more weeks until Christmas! Your turn – what Thanksgiving food do you look forward to the most? For me, it’s all about the mac n’ cheese and cranberry sauce. YUM! i hear you on the hunk and taking break is so important. this thanksgiving, i ate so much mac n cheese and im still craving for some. you need to share me your recipe because im all about mac n cheese now! Glad you had a nice thanksgiving weekend. And sometimes simple homemade meals are the most delicious!